Make your outdoor space come to life with each gentle breeze by placing some fantastically fun wind wheels or spinners in your yard or garden. At Collections Etc., we offer dozens of kaleidoscopic wind wheels that add movement and charm to your garden for an eye-catching finish. Whether you place one near your front door or spread several throughout your lush backyard, you’ll love the way our wind garden spinners make your outdoor spaces come to life. Browse through our complete collection, which is always expanding to account for new items, for a colorful addition that suits your garden’s personality. Making your house feel like a home shouldn’t stop with decorating your indoor spaces. 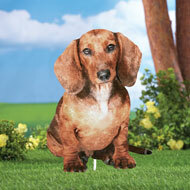 Your yard and garden also deserve to get those special little touches that make them feel welcoming to guests. 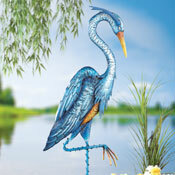 Our entrancing windmill yard art includes dozens of unique designs to help you put your personal stamp on your landscaping. Add a large pinwheel to your garden to give it a rustic touch or use colorful hanging wind spinners to give a plain patio some seasonal flair — it’s all about playing to your visual preferences. The beauty of these lovely garden accessories is that they can be placed anywhere on your property to bring vibrancy and gentle movement to any corner. While many of our yard wind spinners can be used throughout the year, you’ll also find options here that are designed with a seasonal or holiday theme. They are great for making your home feel more dressed up for certain occasions, whether for spring, summer, fall, winter or specific holidays. We offer a number of cheerful and exclusive items for decorating outdoors, all of which will bring a renewed feel to your open-air living space. Shop at Collections Etc. 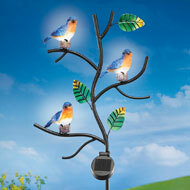 today to discover the best selection of affordable wind wheels for your garden. 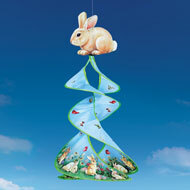 Topped with an adorable bunny, this festive blue spinner features colorful butterflies, bunnies and decorated Easter eggs finished with a green trim. Hook on top for easy hanging. Plastic, stainless steel and polyester. Measures approximately 16"Dia. x 37"H.